Iconic: Battersea Power Station, soon to form London’s Apple Campus, shared with other businesses and 4,000 dwellings. Image by Songquan Deng (via Shutterstock). Battersea Power Station, besides being a short distance from our premises, is a London icon. Since its commissioning in 1933 (and decommissioning in 1983), it has featured on album covers and inspired LPs. After decommissioning, it has been the subject of many speculative redevelopment attempts. Most famously, the owners of Alton Towers amusement park wanted to turn it into an indoor theme park. In 2021, it will find a new use: as London’s Apple Campus, shared with 4,000 dwellings and other businesses. To celebrate its 85 years or so of its existence on the banks of the River Thames, here’s a selection of unusual facts about Battersea Power Station. The power station’s heating system was a magnet for London’s stray cat population. At one time, 200 moggies used to gather outside Battersea Power Station. Perhaps they were also trying to avoid the dogs’ home. We shall leave the rest to your imagination but in 1997, the singer wanted to develop the power station as a ‘self-contained fantasy centre’. Back then, The King of Pop was friends with Mohamed Al Fayed and probably had designs on developing both banks of the River Thames. That we shall never know, apart from the fact he only saw one Fulham game (against Wigan Athletic). During the Second World War, surplus banknotes were burned as well as coal. With the prospect of a German invasion looming large, this was so surplus notes didn’t fall into enemy hands. Talk about having money to burn. 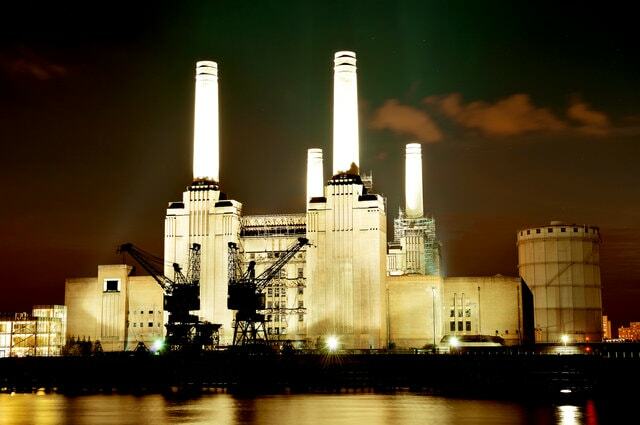 As well as being the subject of Pink Floyd’s Animals LP (1977), psychedelic group Junior’s Eyes made a concept album on Battersea Power Station. The whole of the ‘A’ side is devoted to the power station itself. As for the group, they were David Bowie’s backing band at the time. Bright Sparx London, 24 April 2017.